Will he protect only his followers? What would happen to those who are not his followers? Will they have to die? When there is a danger, without making any distinction between his followers and disbelievers, he will protect every living being, even at the cost of his greatness. AzhwAr says that when there was danger through mahAbali (a ruler in the lineage of hiraNyakashyap and prahlAdha) and deluge, he took the form of a mendicant to beg from mahAbali and took the form of a boar to dig out the earth respectively, not minding about what such forms would do to his greatness. Let us look at the pAsuram. kidandhadhu anrE – was it not staying? poru kOttu Or EnamAy – as a boar with tusks meant for battling. He took the incarnation of boar which keeps digging at all the places with its tusks. The boar cannot keep quiet without digging; it is its nature. When not digging the earth, he would dig the saffron present in bhUmip pirAtti’s bosom. Or Enam – an incomparable, unique boar. Even if he has a body which could be destroyed, his beauty was such captivating that one would carry out Alaththy (a custom carried out in the southern parts of India to ward off evils). pukku idandhAykku – the way the boar went under water to search for earth which had got stuck to the walls of the universe. Just us pearl divers dive into the deep parts of the ocean in search of pearls, emperumAn also dove into deeper parts to search for earth. anRu un oru kOttin mEl kidandhadhanRE – the earth that you dug out from the deep waters with so much of involvement was lying at one corner of your tusk like a bluish jewel! (the opinion here is that the earth was so small compared to his huge form that it could have passed through the gap between his teeth). It is clear from this that the involvement of the person who protects is much larger than the object that is to be protected. When a magnanimous person is asked to arrange food for one person, he would arrange for nine persons. In the same way, to dig out such a small earth, emperumAn took the huge form of a boar. virithOtta sEvadiyai nItti – stretching his reddish coloured divine feet which were like the blossomed petals of a lotus. While there is reference to only the petals here, mentioning the petal is equivalent to mentioning the flower itself. Another interpretation is: “virithOtta” also refers to shining ear studs. Here it would be calling out to emperumAn who has shining ear studs [and then referring to his reddish coloured divine feet]. mAvadivil nI aLandha maN – the huge form that you had taken as thrivikrama in order to measure the earth. Wasn’t that same earth like a dot on your tusk when you took varAha avathAram! 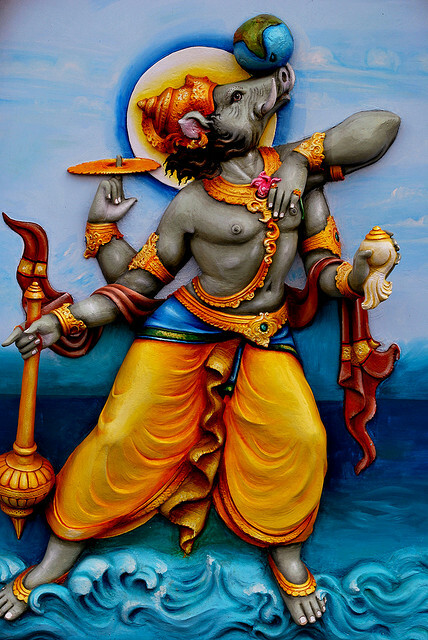 The opinion conveyed in this pAsuram is that emperumAn will carry the earth on his head as well as on his foot in order to protect it (as varAha and as thrivikrama respectively) when his focus in on protecting the earth. We shall next enjoy the 10th pAsuram. This entry was posted in iyaRpA, mudhal thiruvandhAdhi on June 18, 2017 by T N Krishnan.